Neon signs can be a fun and edgy addition to spice up a boring dorm room, but they often reside in the expensive category of room décor with costs ranging anywhere from $60 to $140. Lucky for you, the same thing can be created at home for way less and do not worry, it does not require complex electrician knowledge or glass blowing skills as one may think. 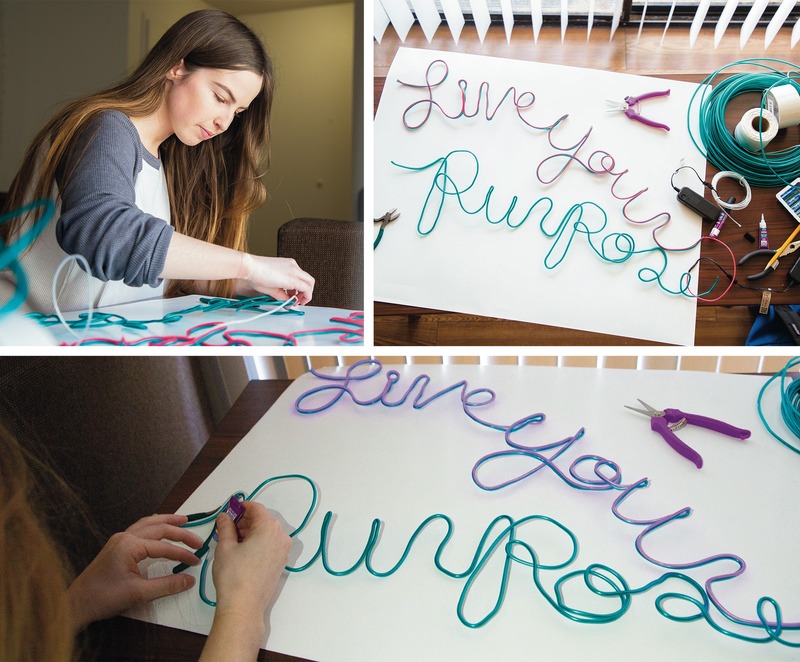 With all supplies included, this neon sign will cost approximately $26 to make. For this project, you will need up to nine feet of electroluminescent (EL) wire, which can be found on Amazon in a variety of different colors. EL wire is the most important component as it will act as the light source for the neon sign. Other necessary supplies include multipurpose wire from any hardware store, pliers, wire cutters, super glue for plastics, AA batteries, string of any kind, clear push pins, a large piece of paper and a pencil. • Step One: Take a large piece of paper and sketch out the words you would like the sign to display. This will need to be done in cursive in order to ensure the letters connect. • Step Two: Use some string to measure out how much multipurpose wire will be needed to fit the words on the paper. • Step Three: Line the string up to the wire and use the wire cutters to cut it to match the exact length. • Step Four: Take the multipurpose wire and mold it on top of the words to replicate the design. Use the pliers to tighten tough corners. This step can be tedious, but it does not have to be perfect. The EL wire will mold much easier over the multipurpose wire and can disguise rough edges. • Step Five: Use the super glue to bind the EL wire to the multipurpose wire, stopping every few inches to make sure the glue has dried and the wire stays in place. • Step Six: (optional) Wrap white tape around the remaining portion of EL wire to help it blend into the wall. Once the letters have been fully covered and the glue has dried, it is ready to be hung up on the wall. Use the clear push pins to hang and securely position the sign. This will help give the illusion of the neon sign floating. AA batteries are needed to operate the EL wire. Simply light up the neon sign by using the on/off switch located on the battery box. If the sign is going to be placed on a vacant wall, you may want to use tape to attach the battery box to the wall so it does not weigh down or bend the newly completed neon sign. In all, this creative DIY project should take no more than two and a half hours to complete. It may take some patience at first, but the end result will make it all worth it. This would be the perfect addition to a dorm room, with endless possibilities to customize the words and colors to reflect the creator’s own individual style and personality.